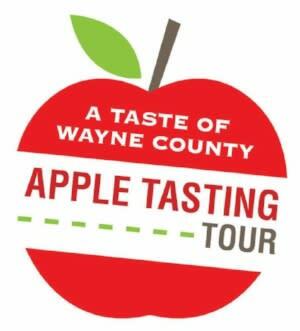 Wayne County, N.Y. - The annual Wayne County Apple Tour celebrates its 21st birthday this fall. Since 1997, apple lovers throughout western and central New York have explored Wayne County to pick fresh apples, enjoy the fall colors, and enjoy a day of family fun. The Apple Tour tradition has grown through the years, and so has its offerings for adults. Now home to three wineries, three cideries and one distillery, there&apos;s plenty for friends, couples, and even Mom and Dad to enjoy. In 2017, the tour won a New York State Tourism Industry Association (NYSTIA) Tourism Excellence Cultural Heritage Award. This award was presented to Wayne County Tourism Office by NYSTIA at their Annual Meeting. Wayne County Tourism partners with 13 local businesses to host the tour. The tour runs throughout October, giving visitors a chance to experience apple harvest at as many farm markets, apple orchards, wineries and cideries as they can. Every stop visited earns a stamp on the tour map, that can be mailed to the Tourism Office, postmarked by November 6 for a chance to win a gift basket. Download the tour map at www.appletastingtour.com, or pick up a copy at any tour stop. Prizes are also given out in September through the Facebook page. Before the tour officially begins, apple lovers can keep up with tour details, fun apple facts and recipes and participate in a weekly contest by liking the Apple Tasting Tour on Facebook. Four lucky trivia winners will receive a $20 gift card to one of the businesses on the Apple Tasting Tour. Three stops are also celebrating a milestone birthday in 2018. Thorpe Vineyards, recently featured in national publication Bustle as a women-led winery, turns 30 this year. Long Acre Farms, home of the original Amazing Maize Maze and J.D. Wine Cellars, celebrates 25 years and Young Sommer Winery reaches its 10-year anniversary this year. Wayne County is the largest apple-producing county in New York State. A "Tasting Weekend" from October 5-8 (Columbus Day Weekend) boasts plentiful activities and extra celebrations along the trail over the holiday weekend. Try a glass of hard cider at Rootstock Ciderworks, Embark Craft Ciderworks at Lagoner Farm, or Old Goat Cidery at The Apple Shed. Sample locally distilled spirits made from local apples at Apple County Spirits.